There are 198 pet friendly hotels in New York City and 12 in Brooklyn alone, making this state one of the easiest places to travel with your dog or cat. The Hilton Times Square Hotel, Eastgate Tower and JW Marriott Essex House are but three of the many pet friendly hotels in New York in the heart of Manhattan. All of these provide cozy pet beds, tasty treats and dining bowls to ensure your pet feels right at home. With its world-renowned skyline, the five boroughs of New York City each sport a distinctive flavor and offer a unique experience for travelers. Visit our New York City Travel Guide for pet owners that has all the pet friendly restaurants, its many on-leash and off-leash parks, attractions, activities and more. When it comes down to it, you and your pet will find plenty to do. The Bronx has an upbeat vibe and is rich in history. For a walk on the wild side, take a visit to the Bronx Zoo. There are thousands of exotic animals in open-air exhibits from South America, Africa, Australia and Asia. The New York Botanical Garden stretches over 200 acres with exquisite gardens of flora and fauna. For some culinary Italian delights, take a stroll along Arthur Avenue for some homemade pastries, mozzarella and specialty meats. The Bronx sports its creative side at the Bronx Museum of Art with showcases of contemporary works from Latin American, Asian and African artists. Brooklyn is a mélange of bohemian vintage, hip culture and cool music. At Coney Island, visitors can enjoy an amusement park loaded with thrilling rides and colorful exhibits. The historic brownstones in Brooklyn Heights are picturesque and worth a view. Visitors can also take a walk with leashed pets along the iconic Brooklyn Bridge and enjoy the stunning skyscraper views. In Manhattan, the energy is electrifying from the jazz clubs in Harlem to the dazzling lights of Time Square. Historic landmarks include the Empire State Building, Top of the Rock and Broadway theatres. Visitors can enjoy a stroll through Central Park and test their skills at the two ice-skating rinks at the park. One of our top picks for pet friendly hotels in New York is in Brooklyn. 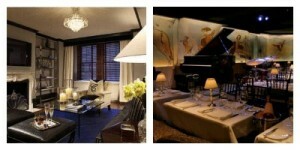 This landmark hotel is The Carlyle, A Rosewood Hotel. It is only one block from Central Park and a five-minute walk from the Metropolitan Museum of Art. Plus, there are many scrumptious pet friendly restaurants to choose from. Queens is a borough filled with international adventures. You’ll find Italian delicacies in Long Island City, authentic moussaka in Astoria, Irish food in Woodside and Mexican food in Corona. For a touch of culture, be sure to take in show at the Queens Theatre and visit the Museum of Moving Image. Take a free ride on the Staten Island Ferry over to Staten Island. Along the way, there are stunning views of the lower Manhattan skyline, New York Harbor and the Statue of Liberty. Staten Island is full of unique art and architecture. The St. George Theatre and the Staten Island Museum are two of the most popular venues. If New York City is your destination, start your search for pet friendly hotels here! Remember, booking early is key when traveling with pets.